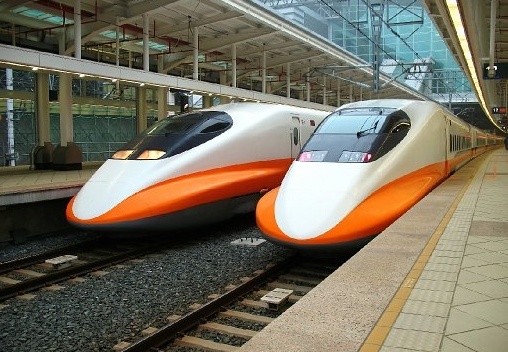 are fixed systems that the Trains, Trams, Locomotives or Under-railway (Subway metro) trains are passing through the system even driven or pulled on a progression system for constant speed. Emollient application arch, nose wash, top brush, top corner brushes, chassis wash and drying unit are some of units. 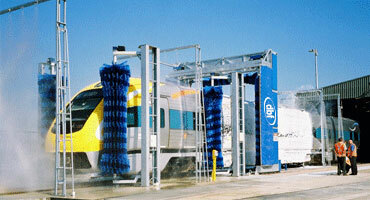 Every installed train wash plant is re-designed through the custom purposes with the DBF Know-How. 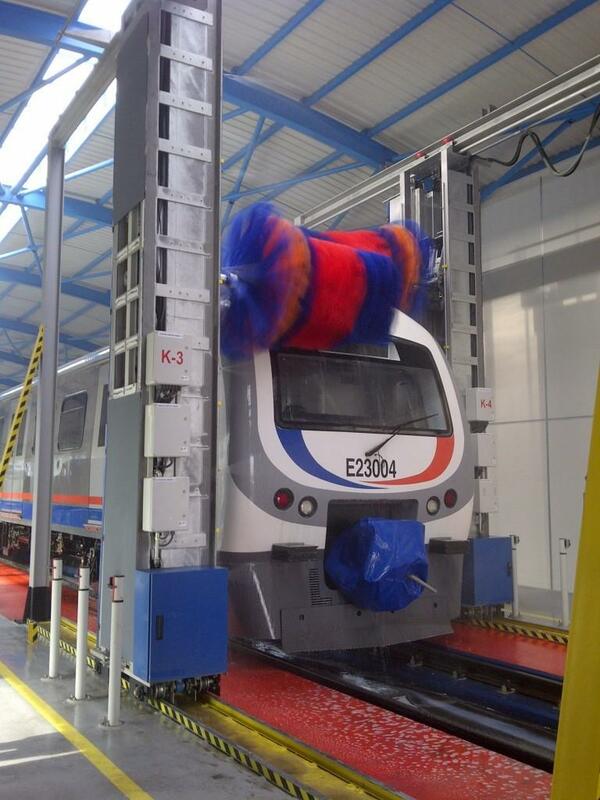 We also produce Train Progression Pulling Systems for the constant and adjustable low speed of the trains for a perfect washing process. We use the latest PLC and SCADA control systems and even have the possibility to design and install the CCTV systems in the plants. 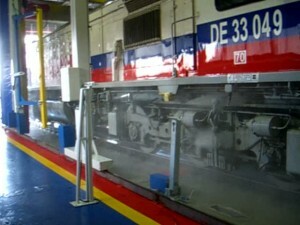 The Train Wash and Dry operations are made by several units and those units work sequentially and automatically. 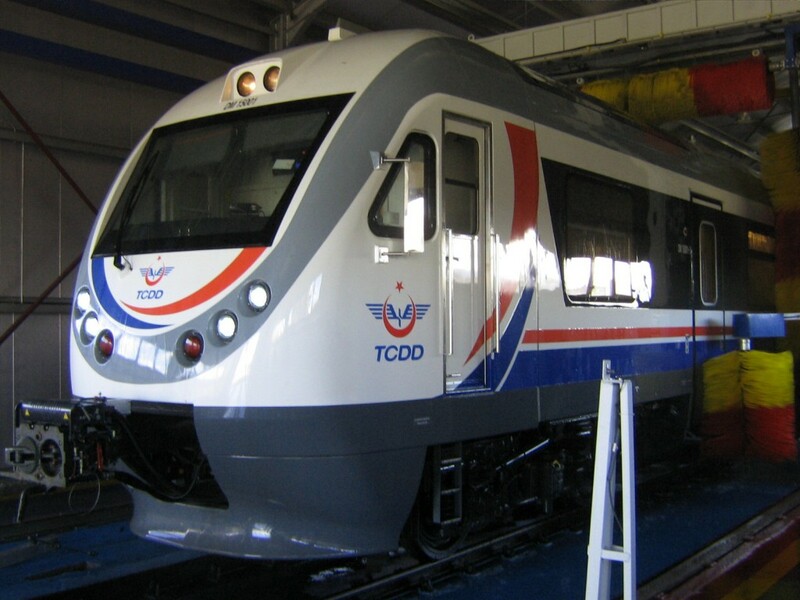 (The contracting Works of these Rail Washing type of machines are made in cooperation with “Bayraktar Makine Sanayi ve Tic.Ltd.Co” in Ankara, Turkey). Those sections are to help washing and drying processes. Those are units that produce a water curtain with certain pressure and flow rate with nozzles alligned on a special pipe system to wash the vehicle surface entirely. On the waxing operation, the washed vehicles are sprayed with drying aid chemicals with a standard flow rate. The wax prevents water to stand on the vehicle by making a Slippery condition before drying phase. The Chemicals are supplied to the spray arches through proportionally adjustable dosage pumps. As the vehicles pass through the systems, the Spraying starts and stops automatically. 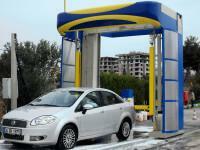 DBF Automatic Vehicle Washing Systemsis 25 years automatic train wash plant manufacturer. With our experience more than 25 years we have designed, produced and installed automatic train wash plant in Turkey; Istanbul Metro, Antalya Metro, Izmir Train Wash, Ankara Train Wash, Ankara, Afyon, Kayseri Locomotive Plants are also references and High Speed Train Washing plants in Taiwan and Australia as well. 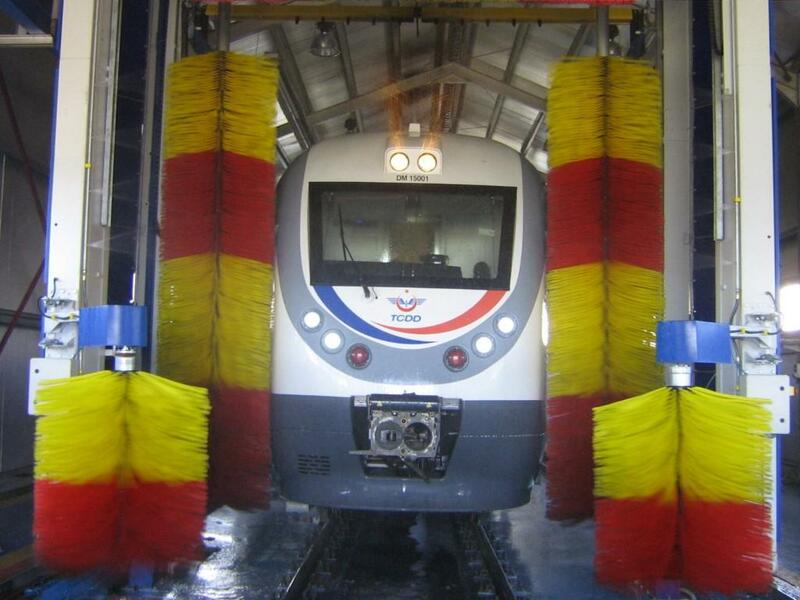 All mechanical, electronical and pneumatical equipment used in train wash systems is supplied from the worlds 1st class manufacturers. Two sets of Side Brushes in this section, are mounted on each side of the track at fixed locations. 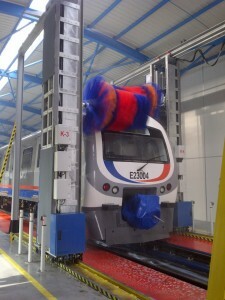 The brushes are retracted back at vertical position at the start and finish of the wash cycle and moves to their horizontal operating positions as the vehicle begins to brush and rinse wash. The brushes follow the contour of the vehicles carefully by the aid of the electronic power brush pressure control. This section includes 2 sets of horizontal cleaning (one on each side of the track) brushes. 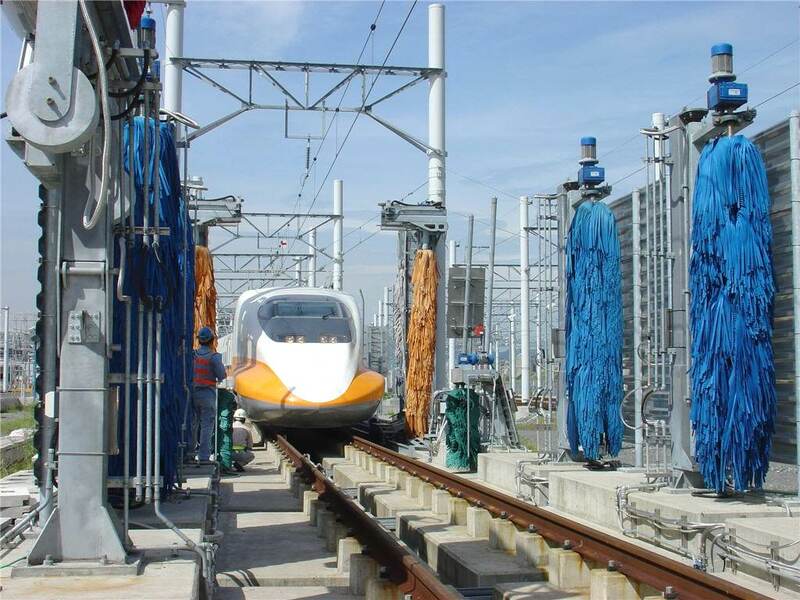 The automatic contour following movement of the Brush Wash Unit especially makes it possible to wash the special contours of the high speed trains efficiently. Those systems have their own chemical dosing and spraying systems. The robotic system gantry moves forward and backward and the horizontal brush moves up and down in following the nose section of the vehicle while washing operation take place. In the first forward operation the chemical is sprayed and at the rear movement the rinsing brushing takes place. Two wash units are placed on each side of the washing line who moves in synchronisation. As the washing operation of the nose finishes, the brushes get back to vertical position as the washing unit at each side get back to the original positions. The softener detergent which is sprayed is laid on the side surfaces, the upper corners with radius including the side wall tops and the ceiling sides and the side skirt surfaces by automatic brushing actions of those units. Brushes, in this section, are mounted on each side of the track at fixed locations. The brushes are retracted at the start and finish of the wash cycle, moving into their operating positions as the cycle begins to lay the chemical on the surfaces. The brushes follow the contour of the vehicles as they travel past by pneumatic differential regulation control of brush pressure. This guarantees the homogenic distribution of the chemicals on the surface. The upper corners with radius including the side wall tops and the ceiling sides and the side skirt surfaces are washed by automatic brushing actions of those units together with washing water. Brushes of train wash machine, in this section, are mounted on each side of the track at fixed locations. The brushes are retracted at the start and finish of the wash cycle, moving into their operating positions. The brushes follow the contour of the vehicles as they travel past by pneumatic differential regulation control of brush pressure. This guarantees the efficient washing of the surfaces. 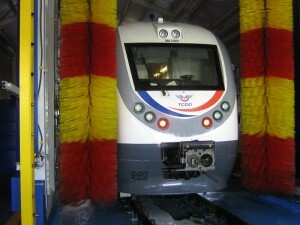 The surfaces of the lower sides of the vehicles are washed by sprayed water and brushing action. The movement of the vertical brush blocks are driven by pneumatical pistons. 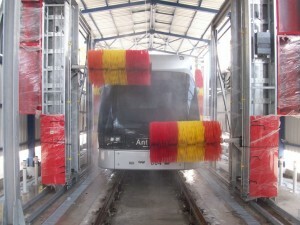 The side surfaces of the vehicles are washed by sprayed water and brushing action. The brushes follow the contour of the vehicles as they travel past by pneumatic differential regulation control of brush pressure. This guarantees the efficient washing of the surfaces. Rinsing removes any remaining detergent from all the railcars as they move through the various sprays and brushes. Re-cycled water from the water treatment system is feeded to brush wash system and fresh conditioned water is feeded to the high pressure final rinsing section to provide steak and spot free rinsing. The rinsing action is maintained by special Spraying nozzles moving up and down and Spraying high pressure (50 bars — 100 bars) water. The section includes its own high pressure pumping group. 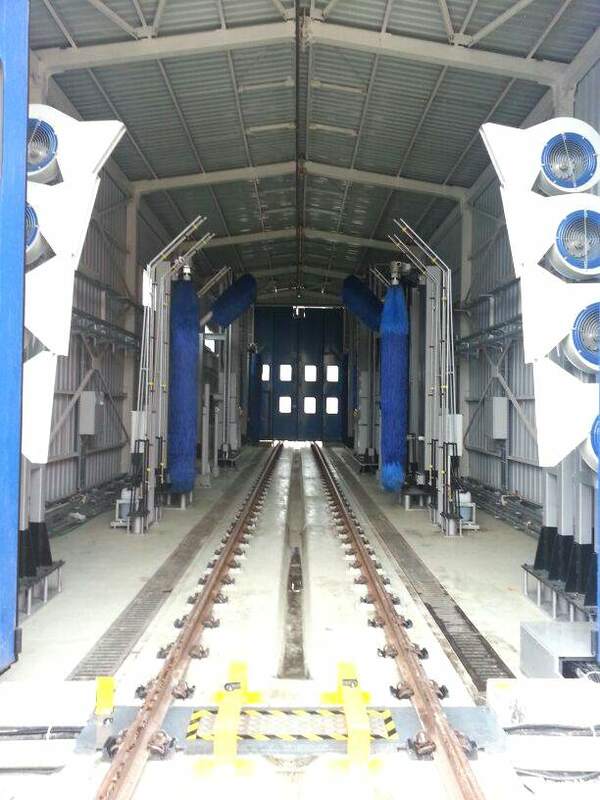 The drying of the vehicles is made by blowing air from high speed fans made of scrolled housings that permit free air flow in direction of impeller rotation. 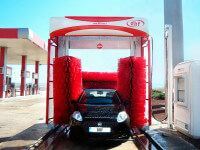 After the vehicles are washed, drying agent wax is sprayed and laid on the surfaces the air blown from the unit sweeps the water from the surfaces. There are different angled fans build on the construction. For maximum drying efficiency those units are designed to blow air beginning from top to bottom in line. 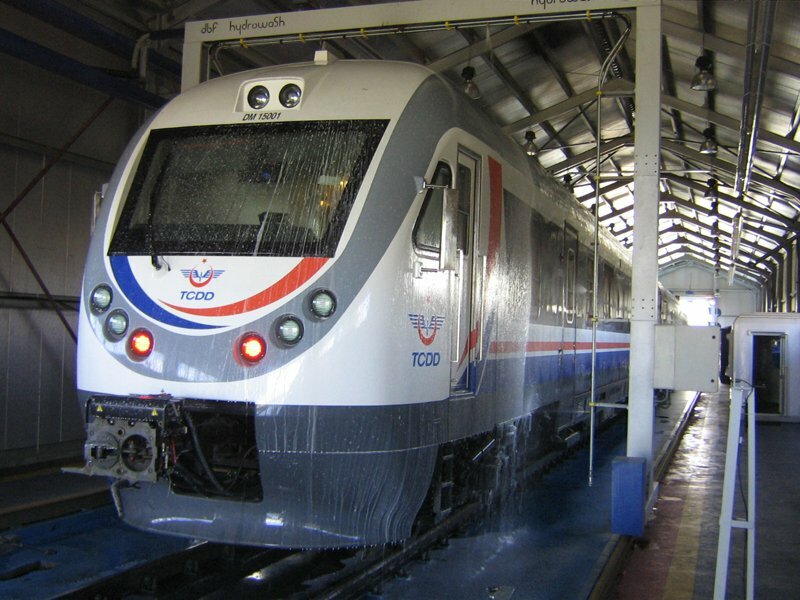 Automatic train wash plant is controlled through a programmable logic controller (PLC) that sequences all the automatic events. 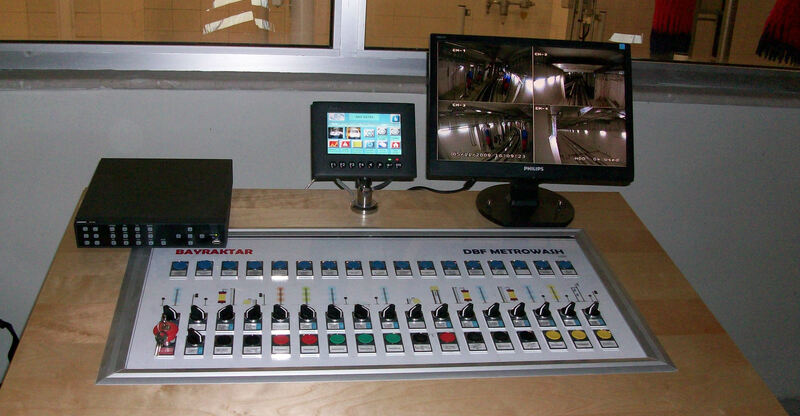 However, the plant can be controlled manually inside the shop and automatically from the depot control room. SCADA system provides the possibility to see all the unit phases while washing action takes place. 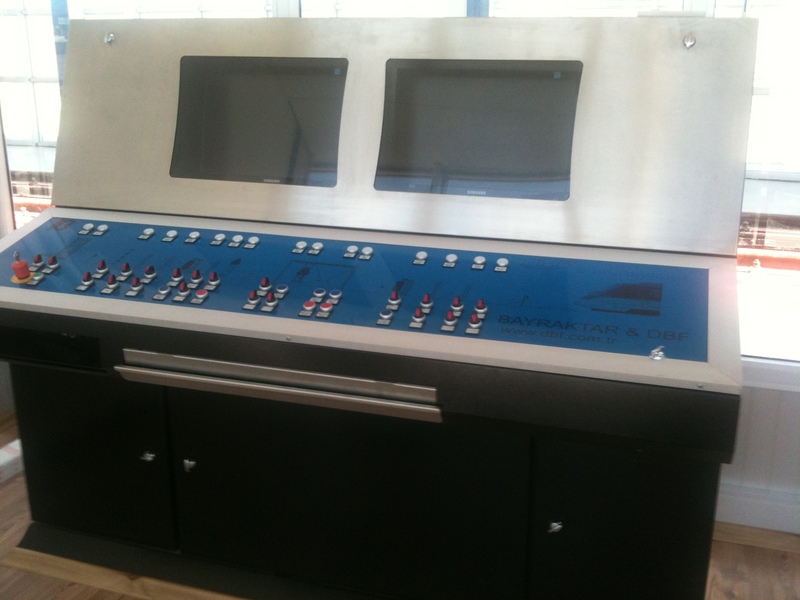 The command, control, working phase, failure diagnostics and feedbacks can be provided by the use of this system. Water pumping, re-cycling, critical level monitoring of the water and the Chemicals, water temperature, air and water pressure, energy consumption of the system, the current values that the electrical motors are fed, the phase and timing of the electrical switches, the actual position of the nose wash system can be seen on the scheme of the plant on the monitor of the main command and control desk. The system feeds back with warnings for the critical levels of the water and Chemicals. From the PC computer daily reports and washing information can be seen. The Close Circuit TV (CCTV) System can be designed and installed by our own personnel. 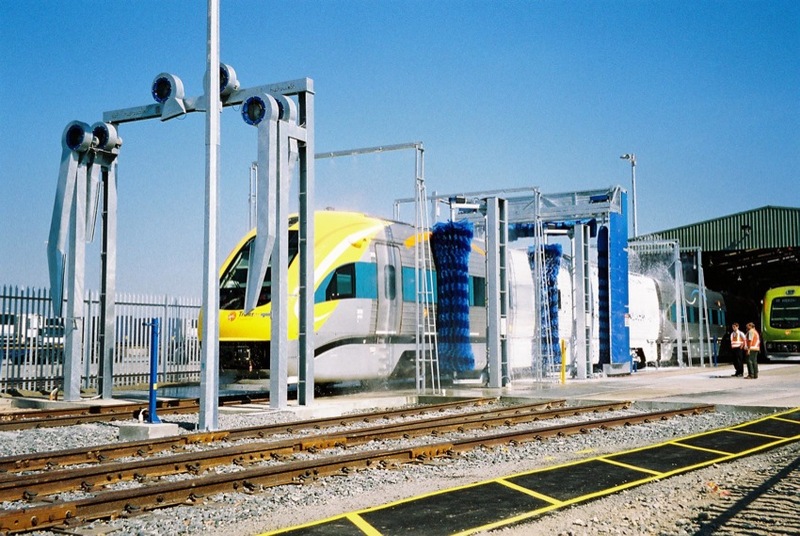 All the phases of washing, view of the units from different angles while working, interior, entrance and exit of the depot can be monitored and recorded by those camera systems. 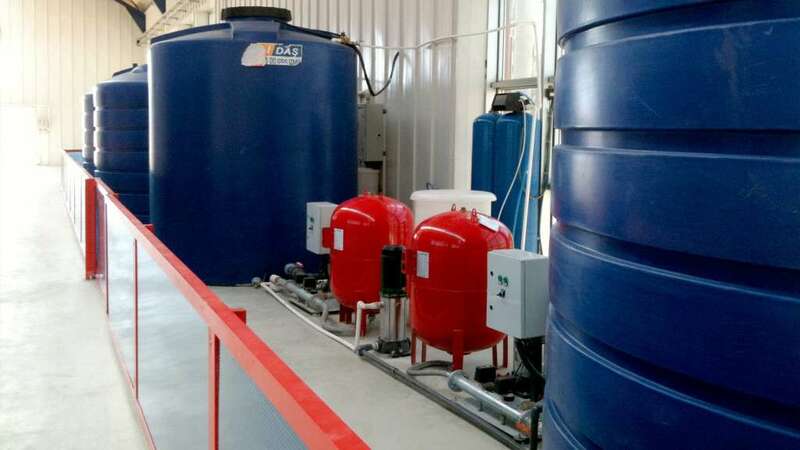 The Waste Water Treatment and Re-Cycling systems are used to maintain the local regulations for water drainage and to save water used during washing operations. 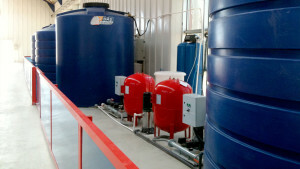 The oil, carbon dust, mud, detergent, drying agent wax and similar dirt remains in waste water are treated in the system. 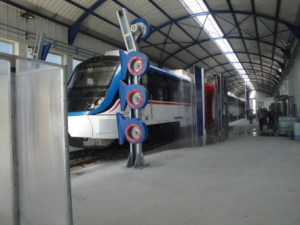 We can build Physical, Chemical and Biological Treatment systems for different purposes.Those systems are designed to work sequentially and efficiently with the train washing plant units. We are also the local distributor of various companies who are the world wide suppliers for Biological Waste Water Treatment and Re-Cycling systems. 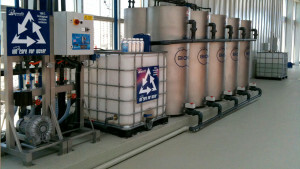 Water filtration, softening, de-mineralisation, reverse osmosis systems can also be installed. Under the fast train chasis and bogies there forms masses of ice and snow due to cold weather in winter days. Those ice masses may damage cables, brakes and other critical components. Hot or cold water through impact nozzles pressure sprayed from special piston pumps are used to bring the ice masses down. Then special Chemicals like propylene glucol can be sprayed in low pressure to further melt the remaining ice and snow. In order to prevent from the formation of ice and snow on the bogies and the under parts of the the fast trains, hot water and anti—icing special chemical mixture can be. 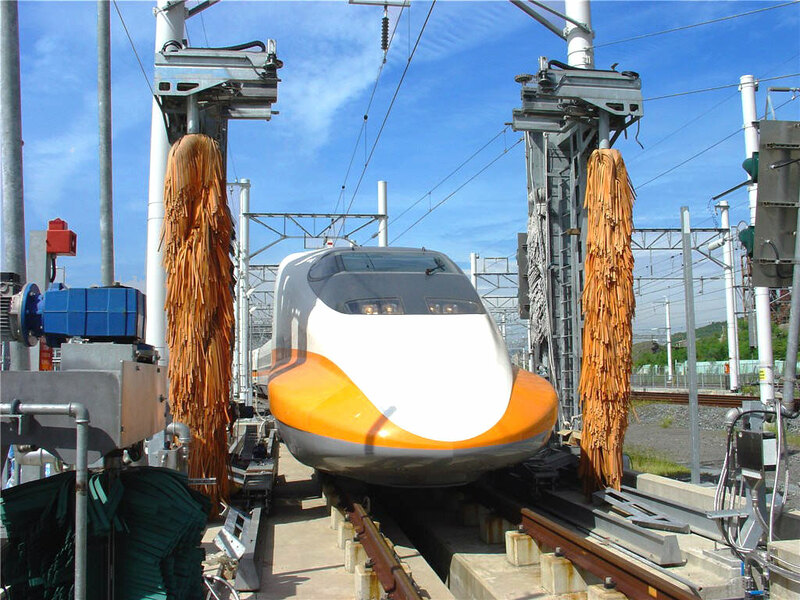 The Train Progression Pulling System is designed to move the trains and wagons at speeds lower than the speeds that can be driven by its own engines. 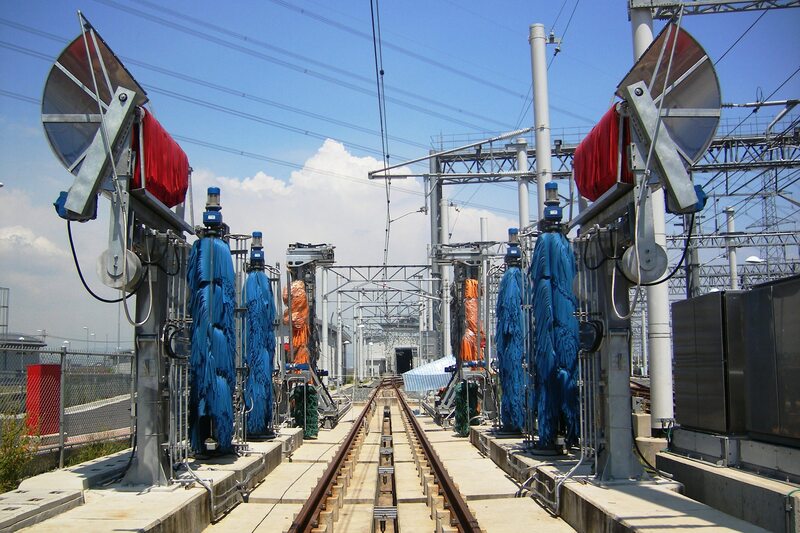 With some special mechanical without electrical equipment the wheels of the train are trapped by the system and after the pulling by wire rope action is completed, the wheels are released. The equipment speed is under the control of an invertor. It can also be controlled by the washing systems main computer.